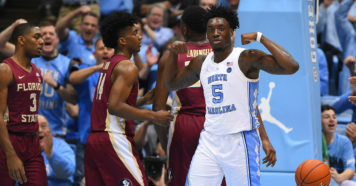 While most college basketball fans in the country were busy watching the 2019 NCAA Tournament, the 32 teams that qualified for the NIT were playing a slightly different version of the sport we know and love. There were four rule modifications in the 2019 NIT, which are outlined below. The 3-point line was extended to 22 feet, 1.75 inches – roughly 20 inches further than normal. The lane was widened from 12 feet to 16 feet. The shot clock reset to 20 seconds after an offensive rebound instead of 30 seconds. Team fouls reset at the 10-minute mark of each half and one-and-one free throws were eliminated. Teams shot two free throws after the fifth team foul for each 10-minute segment in a half. Teams were given two free throws after the second team foul committed with less than two minutes remaining in each half if the foul occurred before the fifth team foul. The first three rules listed above were also used during the 2018 NIT. Here’s a statistical examination of how those rules impacted play. With an extended 3-point line of 22 feet, 1.75 inches, 3-point accuracy over the course of 31 games in the 2019 NIT was 1.4 percent lower than the season average for the 2019 season. Teams were 474-of-1,436 (33.0%) from behind the extended arc, while teams shot an average of 34.4 percent from 3 over the course of the season, according to kenpom.com. The four teams that advanced to Madison Square Garden for the NIT semifinals had varying success from 3. Texas and Lipscomb, which met in the championship game, shot 39.2 and 38.8 percent, respectively, during the NIT while Wichita State and TCU were 29.6 and 31.1 percent from behind the arc, respectively. Did the extended 3-point line discourage teams from taking as many shots from deep? The 31-game sample size of the 2019 NIT says yes, but barely. 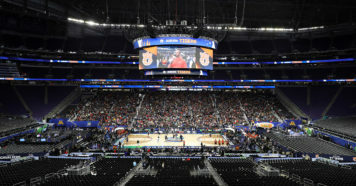 The national average for 3-point attempt percent, meaning what percent of a team’s shots were threes, was 38.7 percent during the 2019 season, according to kenpom.com. In the NIT, 38.1 percent of shots were threes. 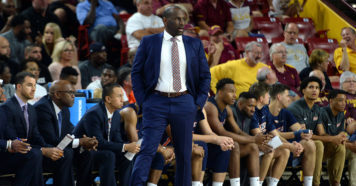 With a lane that was four feet wider in the NIT than during the regular season and conference tournaments, teams shot 50.3 percent (1,172-of-2,327) inside the arc. Over the course of the entire 2019 season, college basketball teams shot an average of 50.1 percent from 2-point range, so there was a very slight uptick in 2-point accuracy in the NIT. While it’s a relatively small sample size and a small increase in 2-point accuracy, this increase would make sense because with an extended 3-point line and expanded line, defenses had to cover more space on the floor, opening up potential driving lanes and making it more difficult for help-side defense to contest shots. There’s an advanced statistic called free throw rate, which is calculated by dividing free throw attempts by field goal attempts. The goal is to measure how often teams, or players, are getting to the free throw line. With team fouls resetting at the 10-minute mark in each half in the NIT, free throw rate declined compared to the national average. College basketball teams had an average free throw rate of 33.0 during the 2018-19 season but the free throw rate in the NIT was 27.9 percent (1,053 free throw attempts compared to 3,762 field goal attempts).